The M. Knoedler & Co. records consist of over 3,000 linear feet of material documenting the operations of the influential American art gallery. Over the past three years and a half, a team of eighteen people at the Getty Research Institute have been processing the Knoedler archive with support from the National Endowment for the Humanities. During this time, materials such as inventory records, correspondence, photographs, and financial records have been processed, cataloged, and made available for researchers. Here’s a look at some of the work involved. 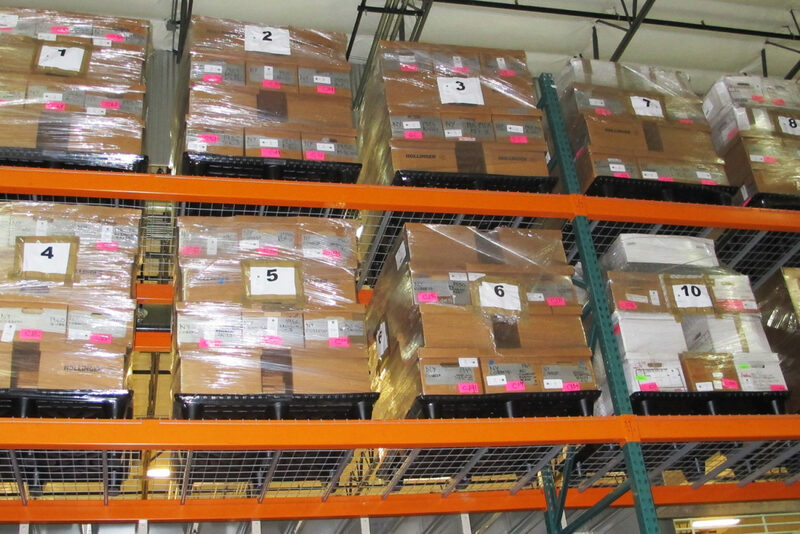 To make the contents of an archive physically available for research, materials need to be processed. Processing involves rehousing items in archival containers, removing or separating damaging materials, and cleaning materials when necessary. Once materials are safely rehoused, they are cataloged into an archival data management system—before Archivists’ Toolkit, now ArchivesSpace—to create a finding aid that allows researchers to locate specific materials in the collection. The Knoedler offices used inventory cards as a filing system to retrieve information on customers, artists whose work they sold, works in stock, and sales. The inventory cards were originally stored in metal and wood cabinets, which you can see below. It would be difficult for a researcher to consult an entire wood or metal cabinet in the Research Institute’s Special Collections Reading Room, so we moved the cards into acid-free boxes. The team removed rusty staples from the cards, but kept the original Knoedler filing scheme. 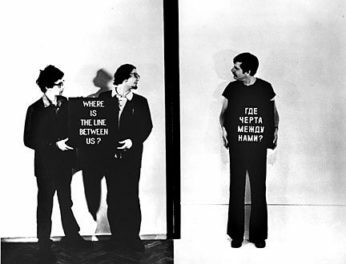 The correspondence series, the second-largest series in the archive (1,626 boxes or 633 linear feet), documents the communication between Knoedler offices, customers, artists, vendors, and other institutions. A majority of the correspondence was originally housed in dusty folders within banker boxes. To make these files available and protect them from further damage, team members carefully removed rusty fasteners, rubber bands, loose dirt, and mold. Documents that were highly acidic (such as newspaper clippings) or showed signs of fading (such as carbon copies) were photocopied onto acid-free paper in order to have a preservation copy. The original documents were then sleeved in Mylar (polyester) to prevent further damage to the documents themselves and to other papers housed within the same folder. As a last step, the correspondence was rehoused in acid-free folders and Hollinger boxes. The photographs series represents artworks purchased and sold by M. Knoedler & Co., as well as artworks that were examined but not acquired. 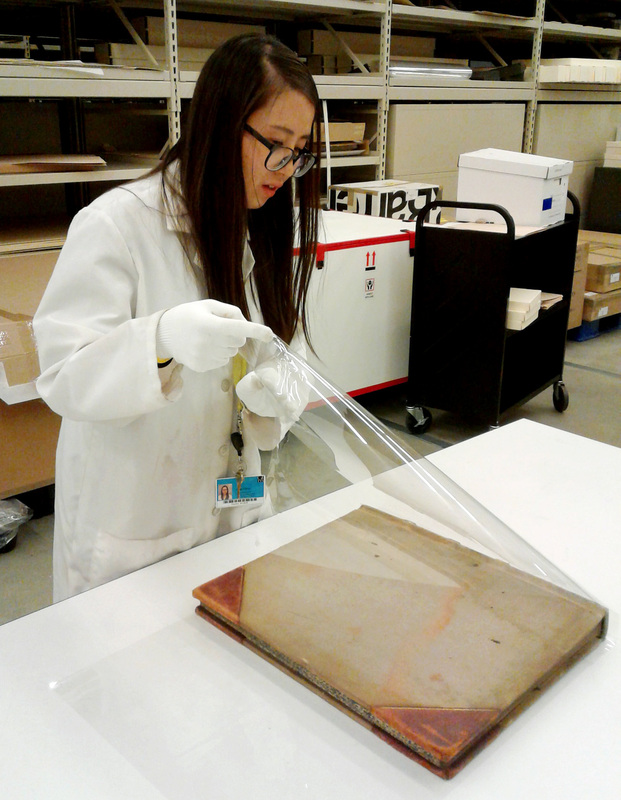 Facilitating preservation, access, and digitization of this material required several steps. The photographic materials were originally housed in typical office folders and envelopes within banker boxes. 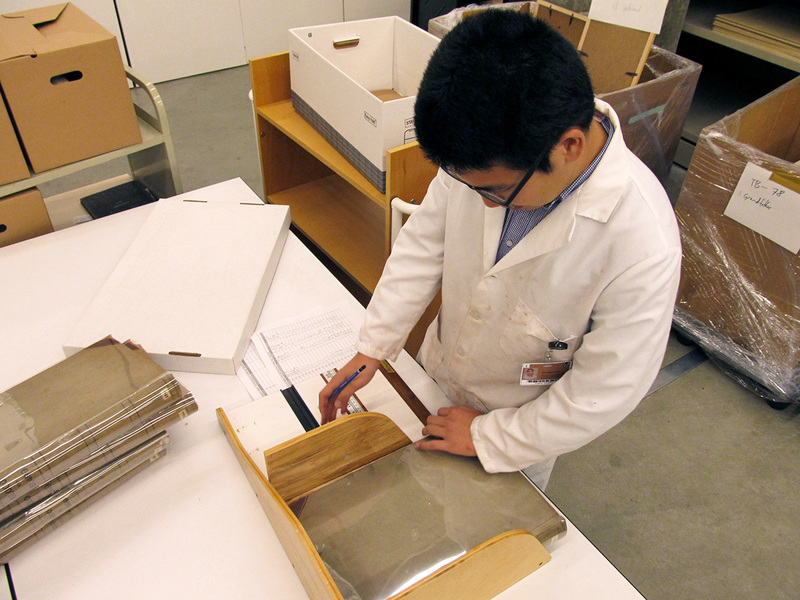 During rehousing, team members sleeved photographs in Mylar. For financial reasons (Mylar is extremely expensive) and for space reasons (each Mylar envelope doubles the space a single photograph takes), only one of the multiple copies of each photograph was sleeved in Mylar. Damaged photographs were also sleeved. Many of the photographs were prepared for digitization. 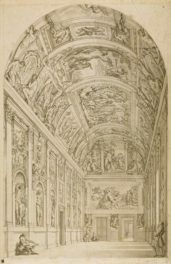 Only one photograph of each artwork was selected for digitization, requiring to carefully select which copy was the best example for digitization. As older photographs are more frequently faded or torn, our selection also involved considering which copy was in better condition. We gave preference to photographs with abundant information on the artwork depicted and prioritized large matte photographs for digitization over small glossy photographs. Negatives, transparencies, and slides are part of the archive, too; these were sleeved in Print File preservers (polyethylene). Once materials were sleeved and the appropriate copy selected for digitization, the materials were placed in buffered, acid-free folders within Hollinger boxes. 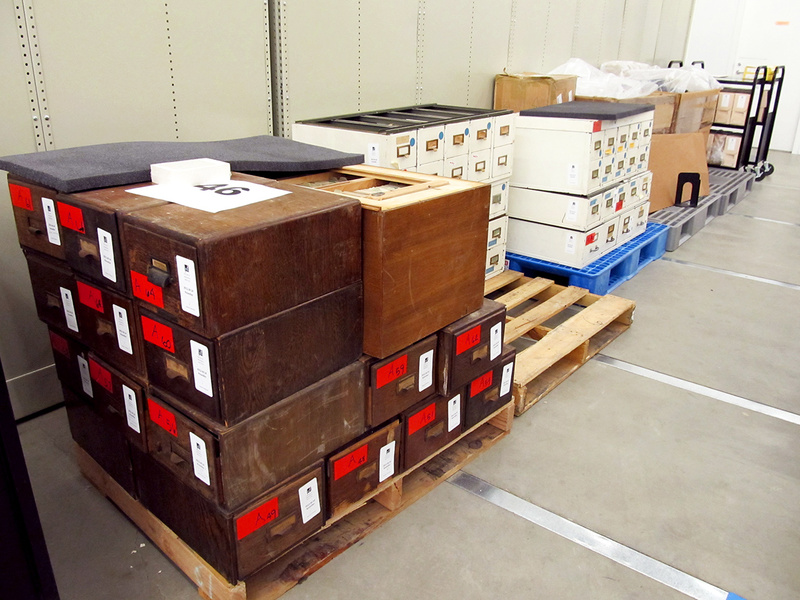 The color photographs, transparencies, negatives, and slides were placed in separate Hollinger boxes so they could be sent to a cold storage facility. Each artwork represented by the photographs, negatives, transparencies, and/or slides was then entered into Archivists’ Toolkit under the artist’s name and corresponding stock number. Series VII, the photographs, is the largest series in the archive—1,570 boxes or 735 linear feet!—and took the Knoedler processing team about a year to process and catalog. Known as the “other financial records,” Series XII documents the Knoedler Gallery’s daily business operations and financial transactions. A large portion of Series XII consists of ledgers recording stock, bills, inventory, and salaries. 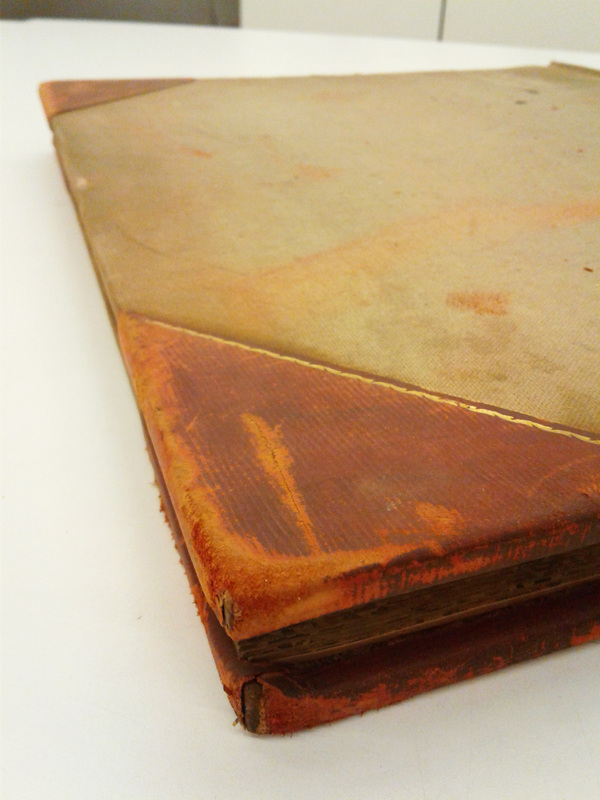 A majority of the ledgers’ covers had red rot, the degradation of leather that causes it to become weak and powdery. 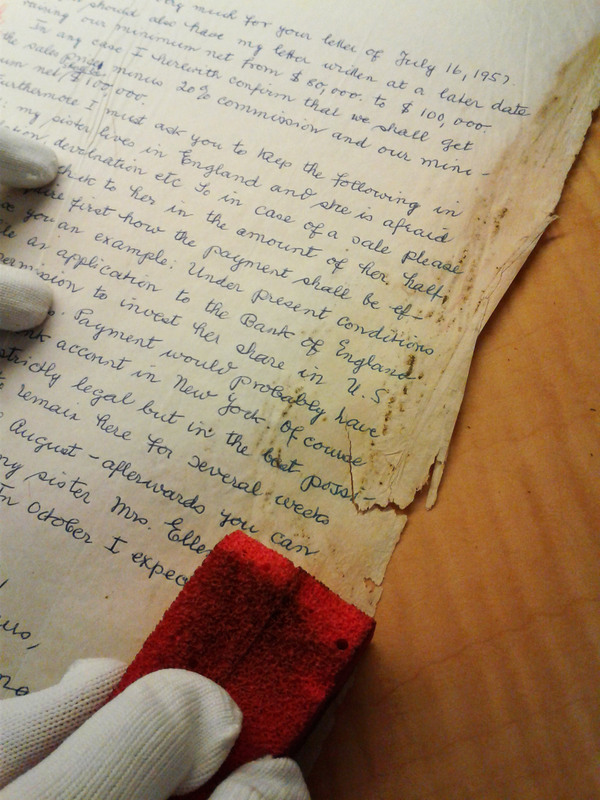 Red rot is irreversible, but we did our best to prevent further damage by covering the ledgers in Mylar. The Mylar covers also prevent the red rot from spreading to other surfaces and collection materials. Once each ledger was cleaned and covered, it was measured for a custom-sized phase box for rehousing. Rehousing and cataloging over 3,000 linear feet of material is a large and complex task. If all of the Knoedler collection materials were lined up box to box, the total length of the collection would equal approximately eight football fields! Since January 2013, a team of two archivists, four library assistants, two graduate interns, two Multicultural Undergraduate Interns, one UCLA MLIS intern, five digital services staff, two conservators, information systems staff, and several work-study students have worked together to process the Knoedler Archive and make it available on site and online. Most of the Knoedler team members hold a degree in art history or history as well as a Master of Library Science. Processing a collection of this size is a great achievement for all of us at the Getty Research Institute and we are thrilled to have the complete M. Knoedler & Co. records now available to researchers. The Knoedler archive is available for study by qualified researchers. To consult online selected digitized portions of the archive, including stock books, sales books, commission books and letters in the archive, visit the Getty Research Institute’s Primo search page. 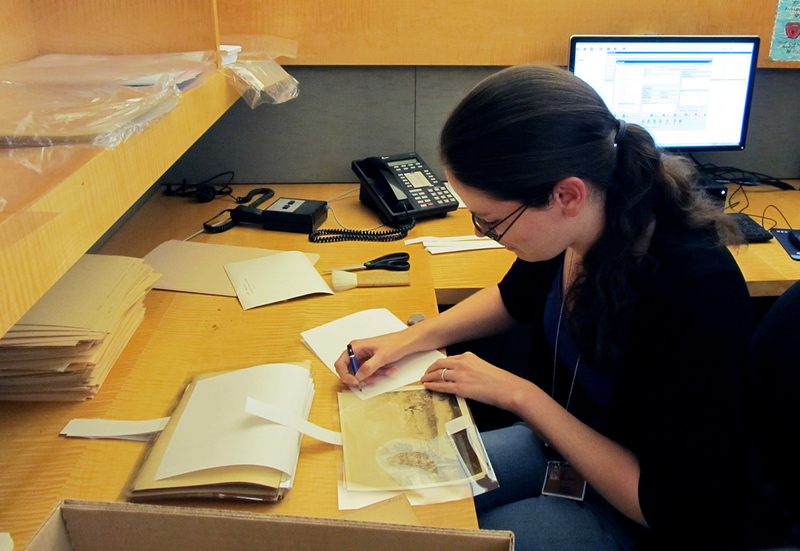 I'm a member of the Special Collections Cataloguing team at the Getty Research Institute.